Shortlisted for The Age Book of the Year, the ALS Gold Medal, and longlisted for the Prime Minister's Literary Award. "Okay, tell me which do you want: to be able to fly or to be invisible?" From an acclaimed and prize-winning writer, the mesmerising tale of a family finding itself, as they discover powers they never thought possible. Steven Amsterdam won The Age Book Of The Year for his first novel, Things We Didn't See Coming. His follow up, What The Family Needed, follows a similar model of a series of interlinked narratives, separated over various time intervals. In this case, the common link is a strange man, Alek, and we see his family over a course of forty years or so. The unique selling point in What The Family Needed is that Alek appears to be able to give his family members superpowers. For example, he asked his cousin Giordana whether she would rather be able to fly or be invisible. Giordana chose invisibility and, to her surprise, discovered that she could become invisible at will. In similar fashion, family members are surprised to discover they have superpowers that they may, at some point, have inadvertently wished for. In the hands of a less skilful writer, we would have jolly japes aplenty. The superpowers would be taken as fact and a parallel world created which stretched credulity to breaking point. Steven Amsterdam, on the other hand, chooses to drop his supernatural people into a very real, mundane world. The reader never believes in the superpowers for one moment but is prepared to go along with the conceit to see where it ends up. And generally, it ends in a bit of a damp squib - the superpower tends to be less useful or less interesting than it might first have seemed and life carries on as normal - a hint of Midnight's Children, perhaps. In this way, Steven Amsterdam gives us a much better understanding of the powers and limitations that we do have. Some of the stories are stronger than others; some of the superpowers seem to be better than others. But the final story really brings things together. It is by far the strangest chapter with a particularly strong image of photographs on the wall of the hallway. It would give the game away to say more, but it is an image that will last. By focusing each story on a different character, we don't get much of a sense of character development, despite the unflagged passage of time between each episode. The star of one story is only ever a cameo in other stories - the spotlight never strays from its target. This means the novel feels much more like a series of short stories - but it probably does have enough by way of theme and common thread to hold it together into a single work. The writing is sublime. Easy, clear, but creating some truly wonderful, fanciful moments. Ben's story and Ruth's story are particularly strong, built on moments of real human drama woven with magic. But the magic is not embarrassing and doesn't lead any of the stories. This isn't a fantasy novel; and it certainly isn't a children's book. It's really a very polished, very grown up piece of literary fiction. 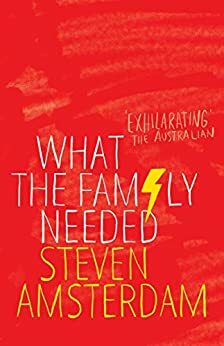 Steven Amsterdam's novel, What the Family Needed plays with the idea of having a superpower get you through a tough time in your life. Each chapter in Amsterdam's novel focuses on a different family member and the time in which they received their super power. The powers are not something that the characters receive with surprise. It's more like it's something necessary to help them. It's this lack of surprise that helped with the plausibility and allowed me to just go along for the ride. It would have become very tedious to read if I had to sit through all seven characters have their individual shocked reactions to their new powers. Just as the book is titled, the characters easily accept the powers as something that they need. I can suddenly dissapear or speed through water? Cool. The family involved is two adult sisters and their individual families. I'm still unsure if I liked how the stories connected. I felt like a few of the chapters would have worked better as a individual short story. i could have enjoyed the content more, rather than thinking about how it was going to intersect with the other characters. I enjoyed the characters as part of a family unit, but overall the premise behind the stories was far more entertaining than the family dynamic. I didn't finish the novel feeling like I gained more from having the stories connected. I would have enjoyed it more if it had been a collection of unrelated chapters. My favorite chapter was, Ben, a father with an infant son who is given the power to fly in order to gain perspective. It was beautifully written and the story least connected to the other characters. I also really loved Peter, who gained the ability to materialize what he needed to have after his wife passed away. This isn't a conventional story involving super powers. The powers are much more subtle and tied to emotional needs. The story has many poignant moments. I enjoyed the concept and Amsterdam's writing style, but admittedly, the story did not manage to hold my interest. I finished it, but there were many times where I fell asleep reading or struggled to keep focused. It was uneven. However, I look forward to checking out other works by Amsterdam, as he has a unique perspective. Like my Review? Check out my blog! 4.0 out of 5 starsQuick and interesting read. Quick read. Love the super powers. I really enjoyed this, and would read other titles by this author. Slightly disappointed in ending b/c it just fell off too quickly for me, but overall I really enjoyed the book. Overall, I found this book pretty good; definitely a really interesting concept, but I'm not sure he got far enough beyond concept for me to love it. The writing style seemed overly simplistic; the characters were developed, but somehow not fully. I enjoyed how he structured the book (i.e., one chapter per character, spanning decades of their lives), so felt that really worked. It was a decent read for my vacation, so definitely kept me entertained, but just falls short of "great" for me. 4.0 out of 5 starsWhat would you do if you found yourself with superpowers? How would it change you? I don't know about you, but when I was growing up (and sometimes even now as an adult), I dreamed of having superpowers. The desire for those powers--of flight, invisibility, super-speed, x-ray vision, etc.--changed based on the situation I was in at the time, but I felt fairly certain that my life, or at least that moment, would improve significantly if I possessed those skills. When Steven Amsterdam's What the Family Needed begins, 15-year-old Giordana and her older brother, Ben, are the pawns in their parents' struggling marriage, and one day their mother decides to leave their father and take them to live with her sister's family. Despite the perpetual animosity between her parents, this move is a shock for Giordana, who had planned her entire summer around hanging out with her friends and working at an ice cream store in town. Yet when they arrive, her anger is quickly tempered when her younger cousin, Alek, asks, "Tell me which you want, to be able to fly or to be invisible." She chooses invisibility, and she discovers her ability to will herself so gives her more insight into her parents' relationship and the path her life was headed down, than she'd ever imagined. In each of the book's related vignettes, which take place over the years, each of the characters suddenly discovers they possess a superpower. Some are truly meaningful--Alek's older brother finds he suddenly has the ability to forge romantic connections between people by simply touching both of them; Giordana's mother, a nurse, finds she suddenly can hear people's thoughts--and others' are somewhat arbitrary, such as Alek's mother, who discovers she can swim with almost superhuman endurance. But all of these characters (mostly) use their powers for good, not evil, and find that the powers changed them in different ways than they imagined. Although I found some of the stories more compelling and emotionally engaging than others, I really enjoyed this book and the magical world it created. I did wish that Amsterdam did more to resolve each of the characters' stories--while we see all of them years after we've learned of their superpowers, we don't know if these skills were temporarily inherited or permanent, and how they made it to a later point possessing those powers. And I loved the emotion of the final story, which finally gave more insight into Alek, who is somehow at the center of everyone's stories, although its resolution had the potential to negate everything that happened before it. This is a beautifully written book, almost lyrical at times, and if you have the power to suspend your disbelief, you'll find yourself emotionally engaged in an utterly unique set of stories, which while fantastical, don't require you to like fantasy or science fiction. Been a fan of Amsterdam's writing since I read his first book's sparse yet evocative prose. This one is just as good, exploring the gap between the familial relationships we might wish for and those we actually have. The idea of granting magical powers lays bare the characters' flaws, foibles and desires as Amsterdam reveals a family's interrelated psyches. Minimalist writing style creates an engaging world and takes the reader on a thoroughly enjoyable journey.